Description The history of cloves is similar to that of nutmeg and mace. 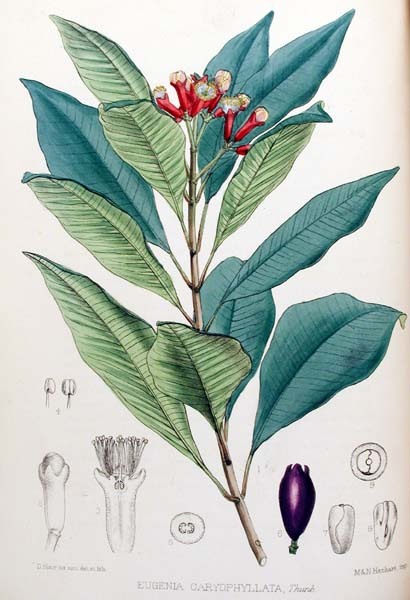 The clove tree (Syzgium aromaticum, or Eugenia caryophyllis) is also indigenous to the Moluccas, and they were probably imported from the Spice Islands into China more than 2000 years ago. 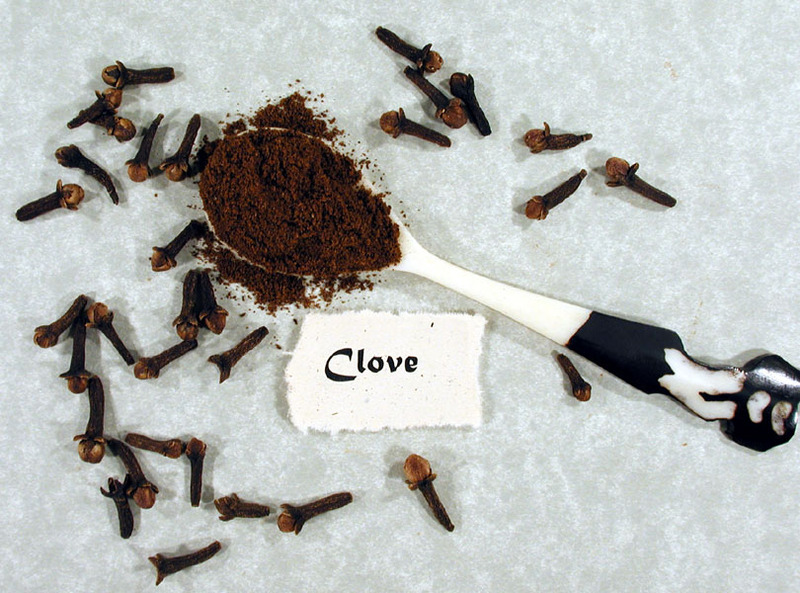 From the 8th century, cloves became increasingly popular in Europe, and along with nutmeg, the importation of this coveted spice helped the enterprising Venetians become extraordinarily wealthy. The lure of cloves and nutmeg attracted the Portuguese to the Spice Islands in 1514; they were followed by the Dutch in 1605, and they retained control over the trade until late in the 18th century, at which time the exotic spices of the Moluccas were starting to be grown elsewhere in the world, and they lost their incredible attraction. Currently, clove trees are grown in such places as Zanzibar, Madagascar and Mauritius, as well as in Ternate, Tidore and a couple of other of the northern Spice Islands and in Indonesia. Cloves are used in kreteks; these crackly, aromatic cigarettes are favored by Indonesians to such a degree that the country has to import cloves from Africa to supplement its own indigenous crop. The word clove comes from the Latin word clavus, meaning nail, since the shaft and head of the clove bud resembles a nail. It is used to flavor meats, including ham, and is incorporated in Indian curries and rice dishes such as vindaloo; it is used in pickles and sauces (e.g. Worcestershire sauce) and some European spice cakes. However, its value as a flavor has declined considerably since the time of Magellan. It should be remembered that Magellan’s fateful circumnavigation of the world (1519-1522) started off with five ships and over 250 men. Although only one ship and 18 men returned to Spain, nevertheless its cargo of about 50 tons of cloves and nutmeg were considered to have made the expedition a financial success. Cloves and nutmeg were among the most precious of items of Europe of the 16th and 17th centuries, and they were worth more than their weight in gold. Fortunes were made in the East Indian and Spice Island trade, since precious spices brought huge rewards to successful importers. The glittering wealth of the Portuguese and Spanish courts, of Italian port cities, Dutch trading firms, German bankers and British speculators was followed by the extraordinarily successful entry in 1672 of the United States into the spice trade. Competitive sailing boats helped make Salem the capital of spices in the first half of the 19th century. A certain Elihu Yale, who was born in 1649 in Boston, made his fortune as a spice merchant in India; he gave material support from his family home in Wales to help build up the institution that was to become Yale University. This is, interestingly, located in Connecticut, which was nicknamed the Nutmeg State, since enterprising merchants were able to sell fake nutmegs made of wood to unsuspecting purchasers who valued the spice. See a list of spices by Taste and Hotness. Useful Parts The clove of commerce is the dried unexpanded flower. The principle constituent of cloves, and the one to which their properties are essentially due, is the oil. Medicinal Properties Unlike most spices, clove has an obvious medical value. It contains eugenol which is an effective local anesthetic, and this has long been used in dentistry. Other constituents include salicylic acid. Although the smoking of clove cigarettes is a national habit in Indonesia, the entry of this aromatic tobacco in the U.S.A. was curtailed when suspicion arose that it could cause adult respiratory distress syndrome (ARDS). Clove, which is an aphrodisiac (with properties similar to those of rhinoceros horn – i.e. an imaginary symbol of potency), was a highly valued flavor, a possible food preservative, and a pharmaceutical panacea in past centuries. Now, it is a rarely appreciated spice and an old-fashioned drug that has little role in medicine or dentistry today.